Nestled within a 1.000 acre eco-friendly community full of wildlife, birds, and tropical rain forest. This amazing and versatile estate property consists of a 4 level, 4.000 sq ft guest house with covered car port at entry to upper level plus the adjacent lot with building pad of 25.000 sq. ft. in size - ideal for the construction of a magnificent ocean view mansion with epic views. The existing quest house, features multiple ocean view terraces. Down stairs is a lovely guest suite with full kitchen, private entrance, and oversized terrace overlooking the magnificent Hermosa Surf. This vacation rental apartment is a popular with nature lovers, yoga enthusiast and surfers the year round. 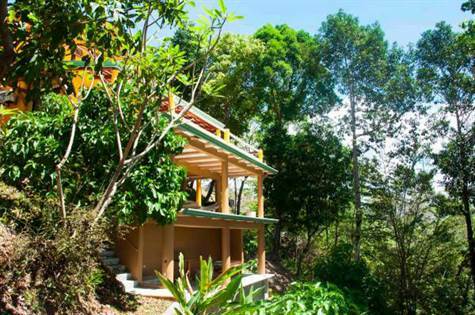 The floor below is a gorgeous Yoga Shala, set in jungle canopy peaking at the Pacific Ocean. The bottom of the 4 floors is ready for your vision. Could be anything from an open air art studio, workshop, home for cook or groundskeeper or even a second suite. This entire Estate Property is 120.000 sq. ft. Surrounding the house are 100's of mature fruit trees and Hardwoods. The adjacent lot features a 25.000 sq ft building pad for future construction. It's one of a kind with amazing 360 degree views of the surf and the valley.